To Hanstholm we came at morning with a little bit delay, because of storm. It took long time before we were in the bus. The most of us were so tired and we tried to sleep. When I woke up, it was afternoon and we rushed through Germany to Czech republic. Near of Czech boundaries we passed bus of our friends from travel agency “Kracalik”. It had accident with some german car. It looked like nothing serious happened. But it was weekend and it took them, long time before they could continue, we thought. E-55 was abandoned, it wasn’t right time for prostitutes. In Prague we broke with most of our travelers. Together with them our bus left also our guide Hynek. Radio Reykjavik stopped its broadcasting for the rest of our travel. In Brno bus left next part of travelers from Moravia. To Bratislava we arrived at evening. There we said good bay to rest of our group. We had only a few of new addresses from our new friends. In shorts, I have never used them on Iceland we divided to our homes. But Iceland stayed in our heads forever. 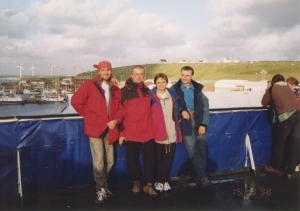 This entry was posted in Iceland 1998, My Travels and tagged Faroe Islands, fo, ic, Iceland. Bookmark the permalink.